Bowden Springs was first built in 1910. Known then as "Carribber Reservoir", it supplied domestic water to Bo'ness and the surrounding district.The upper and lower reservoirs were separated by an earth dam, and, as was common practice at the time, both basins were lined with stone. Maximum depth of both basins is about 9 feet, although the lower basin, Carribber Spring, now has a much lower mean water level than when it was first filled. Both basins are spring fed, draining from the hills around Torphichen to the south. 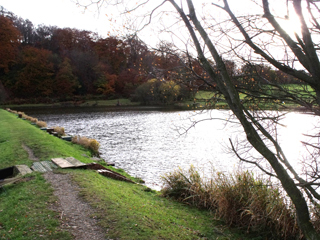 Changes in water usage and abstraction patterns led to the reservoir becoming redundant in 1965, from which time it has been operated as a popular trout fishery, notable for the fact that it is one of the few local fisheries that allow the fishing for trout with bait as well as fly.